Since I have no images of elephants or burro-swallowing anacondas, here’s an image that makes one realize that something does not have to be a mammoth size in order to get BIG attention! Well good morning to you as well! Inspector of just-finished design on bench! How about you? Would this jump start your morning? The Iguana and the scorpion are big…scared me for a moment. Great images! thanks! i’m glad you liked the two examples of big! i enjoyed your post on october. displays of pumpkins are so bright and cheerful! who doesn’t enjoy seeing a cluster of pumpkins! for sure! scorpions are certainly little ‘stingers,’ and inflict much pain! Well, you certainly got my attention immediately. I’ve come to loathe scorpions and that one would have been flat as soon as I saw it. I used to have about 10 iguana on the roof of my house in Oaxaca. Strange creatures with skittery claws on the tiles. Good morning to you, too. oh, to hear an iguana walking across a roof is like wondering if a monster is about to attack! ten would be quite loud! glad you enjoyed the wake-up images! you started the day very early! Beautiful photos, but I am not sure I would like to meet them by myself in a dark alley, :). the locals always warn me to be wary of an iguana’s tail. they swish it back and forth like a sword!!! it’s amazing how much power a tiny scorpion has over most people! they get instant attention and respect! 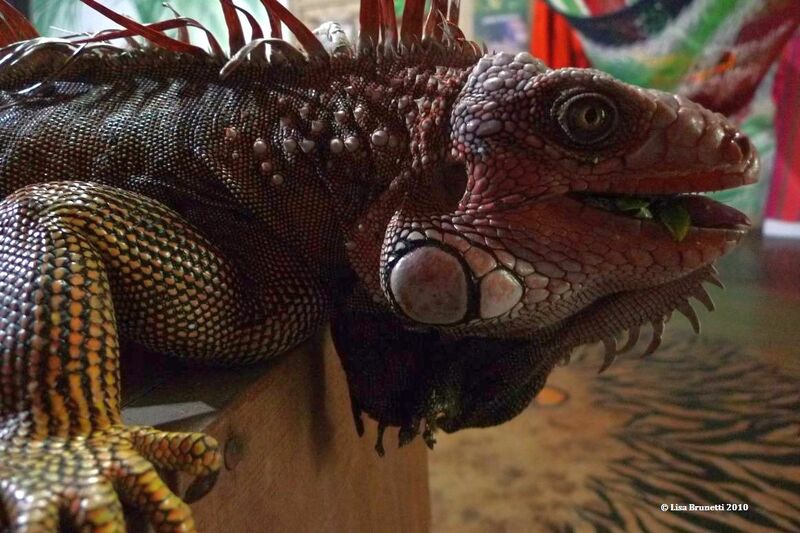 Great photos .. the iguana would look amazing painted with added dragon wings.. we see them in the area here but so far not up close and personal. Locals tell us they’re good to eat, an excellent reason to run and hide when a human comes in to view ! Now the scorpions, different story.. quite a few have found their way inside, but at least they’re big in size and easy to spot..
yes; some of the locals in Costa Rica liked to eat iguanas, too. It was strange that my efforts to photograph ‘Big Red” were poor attempts until the chase brought him to my door! Jump start right out of my skin! Great photos (and I like the design on the bench — what I can see of it). thanks! an iguana ALWAYS gets my attention! designing and painting the mosaic effect satisfies the mathematical side of my brain, though i could paint a ‘fine art’ piece in the same amount of time. after a dozen or so paintings, i always enjoy doing the mosaic style of work. after mapping out the design, filling in the colors is a zen sort of activity. i’m having some withdrawals from not visiting your site in the past few days, though it’s the carrot on the stick! hopefully i’ll get there tonight! time to clock into a day of work on the house! I love both pics, but your iguana is something else!!! iguanans, frogs and geckos crowd some of my computer files! i have enough reference material to draw and paint them for a long time! this one definitely gets the great grandpa award! That iguana is glorious. My wife and I were in Costa Rica several years ago and every morning a big iguana would be sunning himself outside our door. We began to think he was part of the hotel staff, and became kind of attached to him. I know the locals called the tree iguana the “chicken of the trees.” Although we never tasted one to confirm that they taste like chicken. As for the scorpion..be careful where you sit. We have a couple of gold claims here that we find big scorpions in quite frequently. My wife has taken some beautiful shots of them. Although, we have to be very careful between the scorpions and the rattlesnakes, because our dogs travel with us. thanks! i’m glad you liked ‘big red’ as he posed inside the rancho. yes, the iguanas are quite magnificent when they stretch out and sun on hot days! i have learned to aways expect a scorpion. they are interesting creatures, but wow, does that sting bite! one gave me a free ‘drunk for the day’ experience until a doctor gave me a shot and sobered me in about five minutes! I’d hate to imagine the hangover. That is a wake up! Like the mosaic! thanks! the mosaic was painted in belize at a friend’s lodge. i’ll see if i have any better images of the bench. i don’t think you’d care for more images of the scorpion! Do you shake out your shoes before you put them on? Perhaps you’re always in sandals. In the Texas hill country, step one before putting on boots or shoes alway is to give them a hard shake to be sure no scorpions have taken up residence. The iguana is wonderful. I can just imagine the sound of skittering on roof tiles. Our analogy? Acorns on a tin roof! once i truly deserved to be stung! it was early morning, and I was about to go for a run on the beach. i sat on the bench outside and put on one shoe… then the next.. something didn’t feel right, so i took it off and shook it… (duh…) put the shoe back on, and it was still not right. took it off, tweaked my sock, then rammed my hand down to the toe and guess what happened! that blew the lingering sleep fog from my mind! si, i normally check my shoes, jackets, towels… rarely to i let anything touch the ground.. there’re not as bad here in ecuador as in costa rica but i saw one a few weeks ago in the garden. i wonder if iguanas eat scorpions? Okay, I’ll admit it. I don’t know my iguana, but that one looks HUGE, indeed! 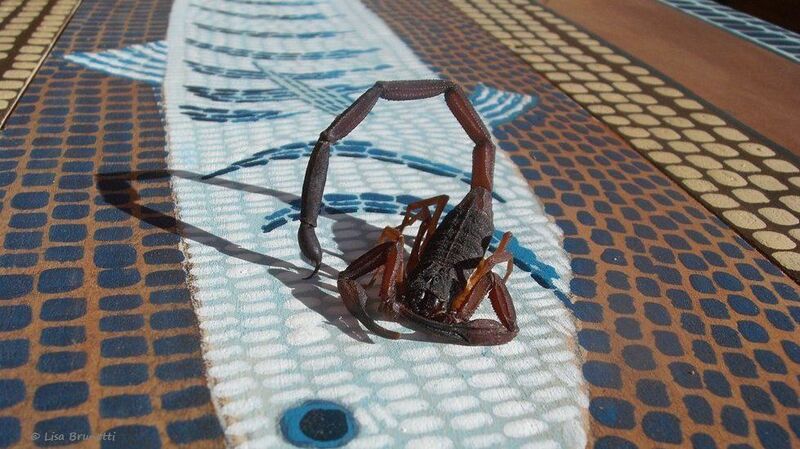 that scorpion was in belize, and i do not think they are deadly. i have developed a ‘sensitivity’ to scorpion venom, so every scorpion presents a possible emergency should i be stung. yes, scorpions have a powerful visual effect, and their nasty sting has an immediate effect!!!! It would SHRIEK start it! thanks, jake! a scorpion will always look quite big to me! YIKES! Jump start would be an understatement for me. ha HA! that scorpion certainly got my attention! it was on a second-floor balcony! I have seen iguanas and love the colorful character you shot but I don’t think I’d ever be able to stop and photograph a scorpion as big as this one! Sheesh. it was as if someone had placed it there in the bright sunshine on the newly-painted table! Lovely bench…but scary inspector 🙂 Wouldn’t have risked stopping to shoot one either! hey! thanks, and you are so right about the inspector of benches! HOLY MOLY! That just made me jump! ja! and your comment made me laugh! thanks, i needed that!